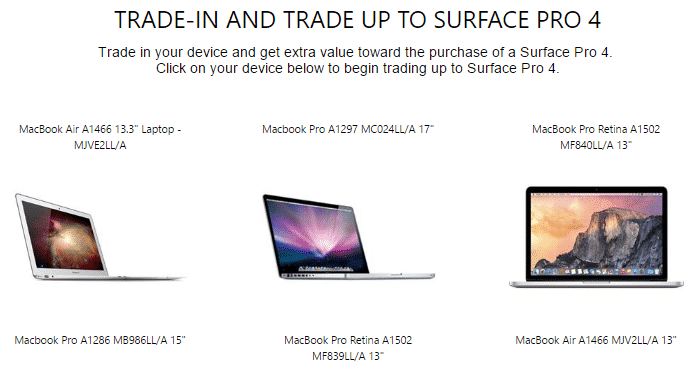 How about getting paid $650 for trading a MacBook Pro or MacBook Air and get a Surface Book or Surface Pro instead? Does the deal sound exciting to you? Well, that’s what Microsoft is trying to do. The software giant is hoping to sway you by paying as much as $650 to get rid of your current MacBook Pro or MacBook Air and “trade up” to a new Surface Book or Surface Pro at a Microsoft Store or via Microsoft.com. Microsoft’s Mac trade-in program is yet another campaign in the company’s buyback battle against Apple. This deal was announced by Microsoft right after Apple’s latest keynote address, where they released the next generation of MacBook Pros. “At this point, they’re really doing customers a disservice to not to have an option for touch on a MacBook,” said Brian Hall, corporate vice president of marketing for Microsoft devices. “We’re going to announce tomorrow a trade-in program so that people who feel disappointed by the Mac not going all the way to touch screen can trade in” their Apple computers for Surface. So, how does this trade work? Depending on the model and condition of your MacBook, Microsoft will be offering customers up to $650 in trade-in value as long as the credit is used towards the purchase of the Surface Pro 4 or Surface Book. Visit this site to find out your trade-in value. Give Microsoft your old laptop and accessories. You will receive an email with a promo code. Use the promo code at checkout to get your discount. If you are interested, then the offer is valid until November 10, 2016, Pacific time 11:59 p.m., or until supplies last.